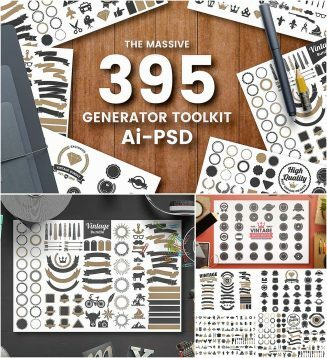 Introducing 395 Vintage Generator Toolkit. This is collection of Vintage Badge and Ribbon elements. All graphics are 100% vector and PSD files. Tags: badge, emblem, generator, logo, logo pack, retro, ribbon, stamp, toolkit, vintage badges.